Grilling season is finally here and nothing completes a meal quite like a side salad. This Cashew Chicken Salad is a fun and delicious treat for any gathering. So in Minnesota it has finally maintained decent weather. I can finally say that winter is gone….yes we have to wait to say that til at LEAST mid May, because seriously, anything can happen in this state at pretty much any given time. We are known to have 50 degree temperature shifts within 12 hours of one another. Well with Spring and Summer brings grilling weather! We are really big on being outdoors so grilling and bonfires happen on a regular basis in our house. And there is nothing better to go alongside your burger or hot dog that a delicious pasta salad! 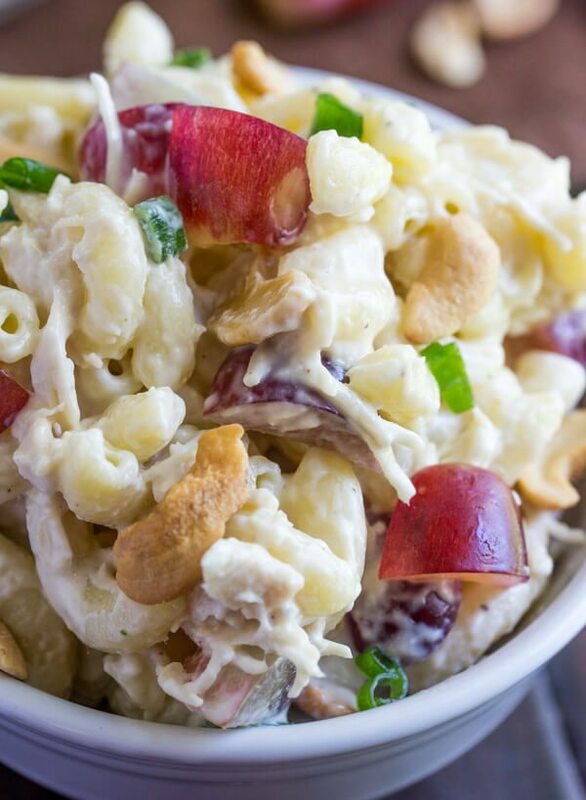 This Cashew Chicken Pasta Salad is quick, easy and filling! 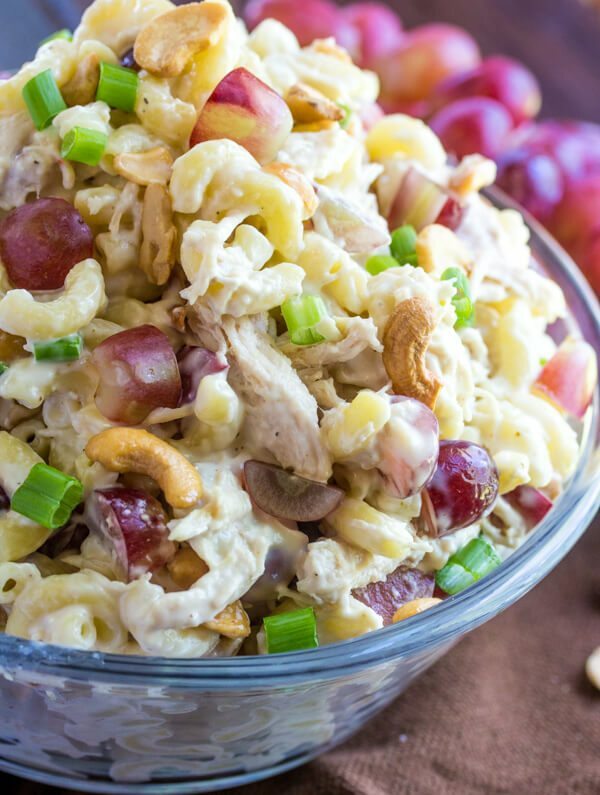 Filled with shredded chicken, grapes, green onions and cashews – this pasta has a fun flair about it that totally sets it apart from the plain old macaroni salad that usually graces our table. 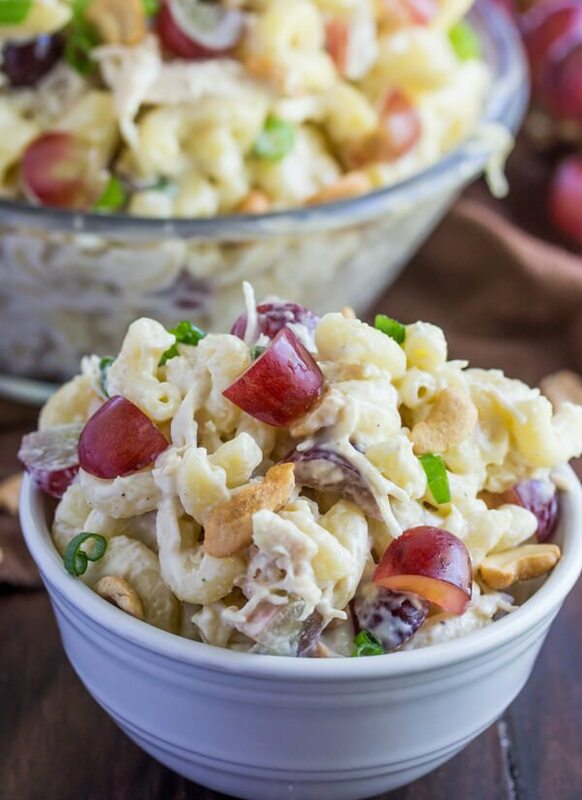 If you’ve never had nuts or grapes in a pasta or chicken salad before, your completely missing out. This salad is almost a mirror image to my favorite chicken salad but with cashews instead of almonds and obviously pasta! Seriously, so so so good. Another thing that sets this Cashew Chicken Pasta Salad Apart is the addition to sugar to the mayo mixture. 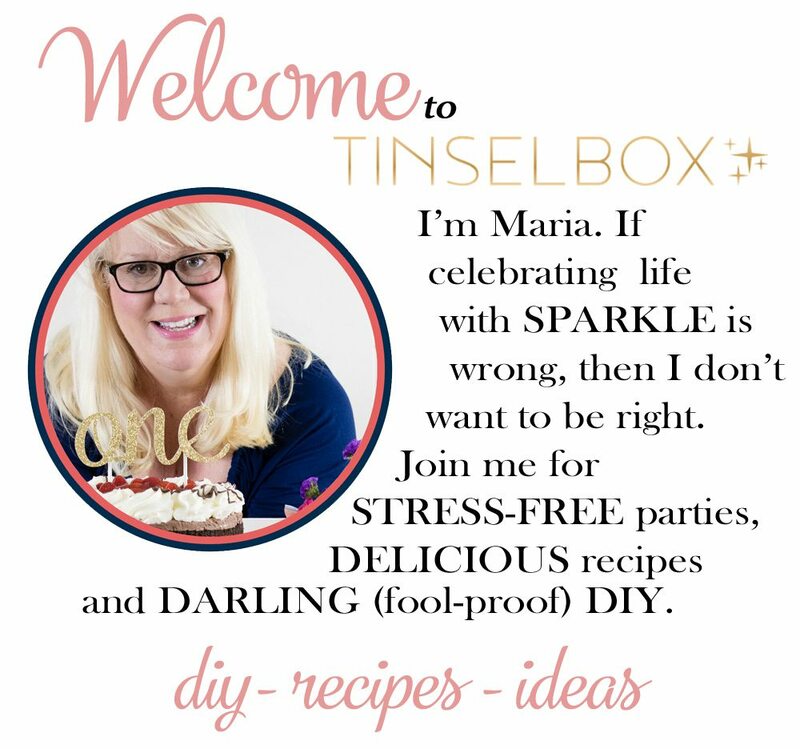 I have a thing for sweet and salty together and once you try sugar (if you already don’t) in a pasta salad you will be putting it in every salad that you make from here on out. 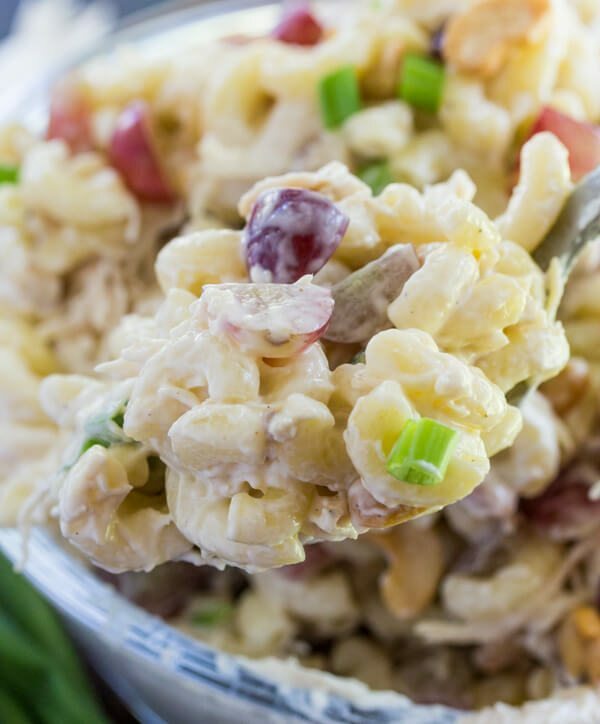 So if you’re looking for a crowd pleasing, pot-luck bringing, grill out taming salad, this Cashew Chicken Pasta Salad is just what you’re needing! 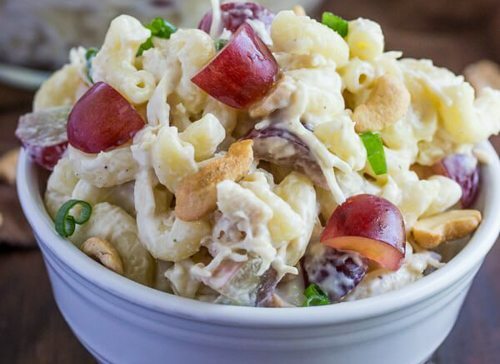 In bowl mix together your pasta, chicken breast, green onions, grapes and cashews and toss to combine. 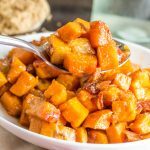 In smaller bowl mix together mayo, milk, sugar, brown sugar, seasoning salt and salt and pepper adding more or less of each for your taste. Pour into pasta mixture and stir to combined. 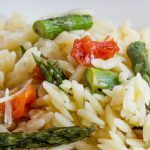 This looks like my favorite spring time food! What part of Minnesota are you in? We’re in Minneapolis and I agree the weather has been a little crazy! Yum, I love all the ingredients in this salad, so I know this has to be good. 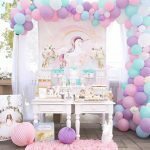 Thanks for linking up with us at the #HomeMattersParty this week.